In a shower of rain. And never went there again! I have experience working, inside an academic environment, as a full-time college sociology professor (specializing in the study of religions, new religious movements in particular) and college administrator. As a sociologist, I have a Doctor of Philosophy (Ph.D. in sociology) and a Master of Arts (M.A. in sociology). Professionally, in addition to previously serving on the board of directors of the Autism Society of the Heartland, I belong to the Initiatives of Change, Sociologists without Borders, Justice Studies Association, the Critical Realism Network, the International Association for Critical Realism, the World Economics Association, the Society for the Study of Social Problems (the mental health section, the social problems theory section, and the disabilities section), the Association for Applied and Clinical Sociology, the New America Foundation, Transformative Studies Institute, the Association for Religion and Intellectual Life, the Institute for Policy Studies, and the International Society for Textual Reasoning. I am a full-time, tenured (full) Professor of Sociology at Johnson County Community College. Located in the Kansas City bedroom community of Overland Park, Kansas, it is one of the top-ranked two-year higher educational institutions in the United States. Outside the academy, I have been a career marketer, resume writer, degreed journalist, and website designer. 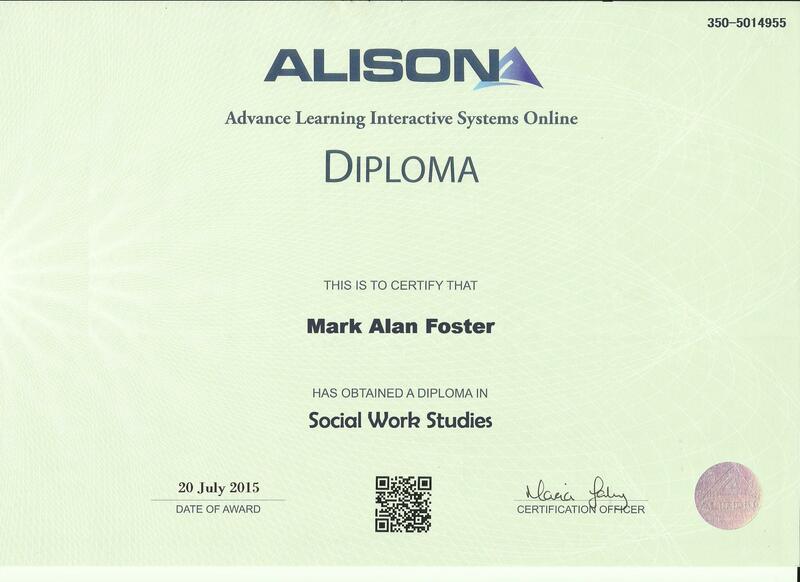 In my continuing education, on July 20, 2015, I completed a Diploma in Social Work Studies at Alison (Advance Learning Interactive Systems Online). 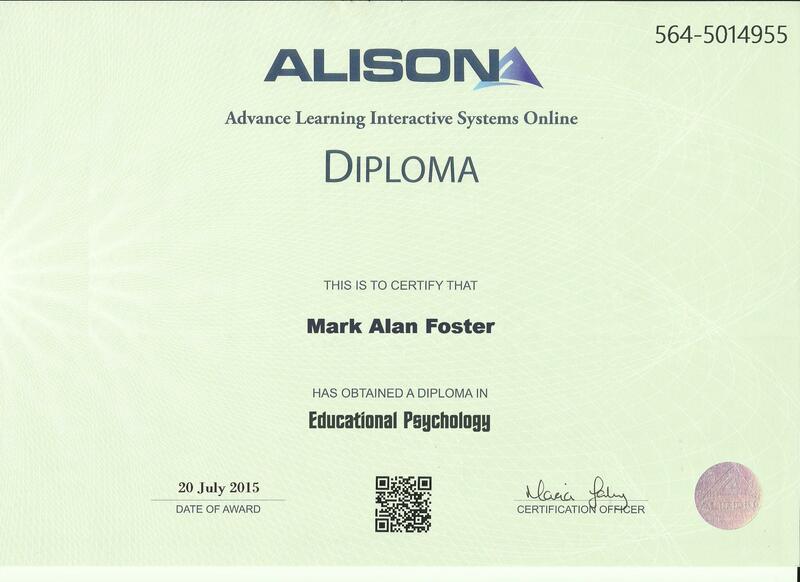 Here is a diploma (made from an online template). In my continuing education, on July 20, 2015 (the same date), I also completed a Diploma in Mental Health Studies at Alison (Advance Learning Interactive Systems Online). Here is a diploma (made from an online template). As a sociologist, I have taught courses in the classroom since 1980 and online since 1994. No matter where in the world you live, I have the experience to effectively meet your needs. I have written extensively on a variety of subjects and can offer you numerous online and face-to-face services. As a journalist, I have a Bachelor of Arts in Journalism (A.B.J. in magazine journalism) and an Associate in Arts (A.A. in English). My primary research area is in religious studies. In my work, I use a new critical theory, which combines cultural Marxism with postmodernisn and other approaches. Macro to Micro, a sociology text I cowrote and coedited, was published by Kendall Hunt. I was the first faculty member in the Johnson County Community College Liberal Arts Division to teach courses over the Internet, which I continue to the present time. I also developed that college's academic ranking system. Previously, I served as chair of two academic departments. Between my positions at three radio stations, I was news writer, newscaster, reporter, and producer. I also published the Middle Georgia edition of Builder/Architect Magazine. These days, however, as an opinion journalist and a web publisher, I maintain the SocioSphere webzine and podcast and sixteen other websites. I have received numerous certifications and trainings in stress management, genogramming, neurolinguistic programming, child abuse treatment, whole brain communication, hatha yoga, and in several techniques of meditation. In 1989, I was certified by Slowikowski & Associates, a leader in the personal growth field, and qualified by Carlson Learning Company, now Inscape Publishing, a human and organizational development firm. In 1990, I was certified in humanistic counseling by The Harrison Institute (predecessor to Lewis Harrison's Academy of Natural Healing) after completing an intensive training program with group practica. I am a signatory to the Earth Charter. I have been a ventriloquist since the age of eight. I also completed several years of theatrical coaching at Hal and Ruth Persons' prestigious Theatre Academy (the Cambria Heights section of Queens in New York City), which began in Lee Strasberg's Little Theatre, and at various other drama schools. I am the sole owner and web developer of the MarkFoster.NETwork™. I suppose that I am an Internet geek (PDF). I am a past president of the Kansas Sociological Association (1995). I was twice a section leader on CompuServe forums (three then two). I also served as forum manager on America Online. I was born in the New York City borough of Manhattan and raised in the Bronxdale neighborhood of the borough of the Bronx (1956-1961)—northeast Bronx—and the Bayside neighborhood of the borough of Queens (1961-1968)—northeast Queens. I subsequently relocated, with my family, to Long Island, New York (1968-1976). I then lived in Athens, Georgia (1976-1978); White Plains, New York (1978-1979); Long Island, New York (1979-1980); Starkville, Mississippi (1980-1984); Long Island, New York (1984-1985); Wise, Virginia (1985-1989); and Macon, Georgia (1989-1993). I currently reside in Olathe, Kansas (1993-present), a Kansas City suburb. On a personal note, I was born of Jewish parents (Ashkenazi) and bar mitzvahed. However, I formally converted to the Bahá'í Faith at fourteen-years old.